KARACHI, Oct 14 (APP):Prime Minister Shahid Khaqan Abbasi Saturday reposed his confidence that the people of Pakistan would decide the future government, juxtaposing the unprecedented performance of Pakistan Muslim League-N with its rival political parties and previous regimes. He noted that democracy was sine qua non for the progress and prosperity of the country and its people. The dictators had always failed to deliver and their rule did not augur well for the country’s future, he said. a cost of $285 million and so far provided berths to 12 coal ships. that the continuity of the system would also provide panacea to certain issues. numerous crises including the crippling power outages. would be nearing completion and now the power supply was in abundance, he added. and other industrial units faced paucity of gas, but the government also took vital steps overcoming the issue. PM Shahid Khaqan Abbasi on the occasion appreciated Haleem Siddiqui and Shariq Siddiqui of Pakistan International Berth Terminal Limited, a public limited company sponsored by the Marine Group of Companies, for making the much needed investment in a sector crucial for national development. environment friendly,” assuring that problem with regard to expansion in railway tracks for transportation of coal from berth to sites of power plants will be addressed without any delay. presentation said the project completed against a cost of around US $ 285 million this year has already successfully berthed 12 coal ships at the terminal. International Finance Corporation (IFC), a private sector arm of the World Bank Group. capable of handling twelve million tons of coal in bulk per annum and with an average discharge rate of over 30,000 tons per day, he said mentioning that international standards have been adopted in cargo handling. 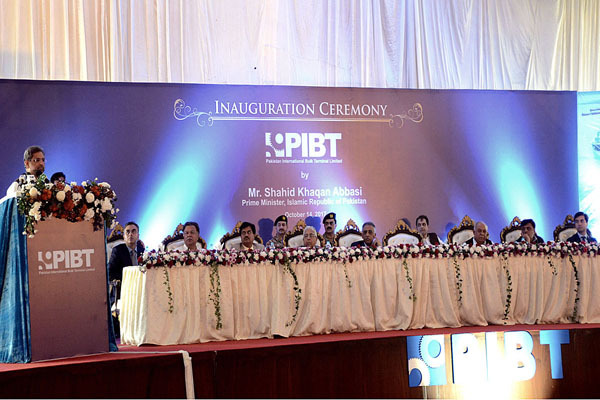 PIBTL, under 30-year built, operate and transfer (BOT) agreement with Port Qasim Authority, has built its own jetty and was equipped with two coal ship unloading cranes and one cement/clinker loading crane, he said. reduced cargo handling time but also decrease wastage of coal and cement during handling and their amalgamation with external particles during storage. The dedicated terminal was dredged to 13.0 meters deep and was capable of handling ships of up to 65,000 tons, said Siddiqui. He claimed the terminal could operate more speedily, efficiently and reliably than the coal operation was being done by stevedores at Karachi Port. took around five days at KPT while at PIBT it could be handled within two days due to modern and mechanized handling system,” claimed PIBTL’ CEO. The terminal jetty, he said has been built to handle deeper draft vessels of 15.5 metres and that PIBT will also be able to handle larger vessels once Port Qasim dredges the channel deeper beyond 13 metres draft. according to the best global standards for cargo handling.